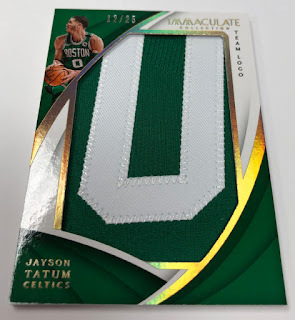 Immaculate Basketball really needs no introduction. Longtime collectors know exactly what to expect: Tons of unique jumbo memorabilia cards (Sneakers, Team Logos, Brand Logos, Team Slogans, Jersey Numbers, Nameplates) . . . Dual, Triple and Quad Autographs . . . Dual Rookie Logoman Autographs . . . plenty of Patch Autographs including RPAs numbered from 99 all the way down to 1/1 Tag variations. 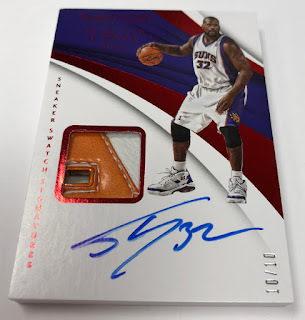 NBA Collectors anxiously anticipate the arrival of one of the most popular NBA products of the year. For some, it’s the irresistible RPAs. Others prefer the enticing array of memorabilia gems. For others it’s the luxurious Logomen. And still, for others, it’s the can’t-miss combination of all three facets that makes Panini America’s Immaculate Basketball franchise annually one of the most successful launches on the market. For the upcoming 2017-18 edition of Immaculate NBA Basketball, that streak of successful NBA products looks to remain intact for another year. Set to arrive at Sports Cards Plus, a.k.a. 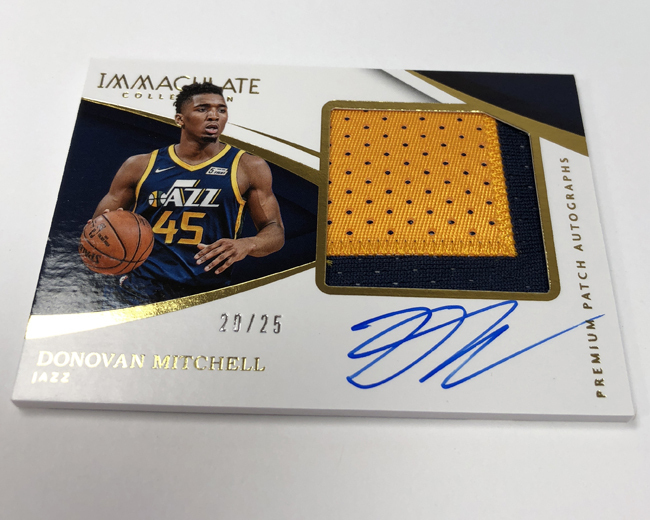 The Super Hit Factory on Wednesday, October 17th, 2017-18 Immaculate Basketball delivers five autograph or memorabilia cards in every six-card box (five boxes per case). 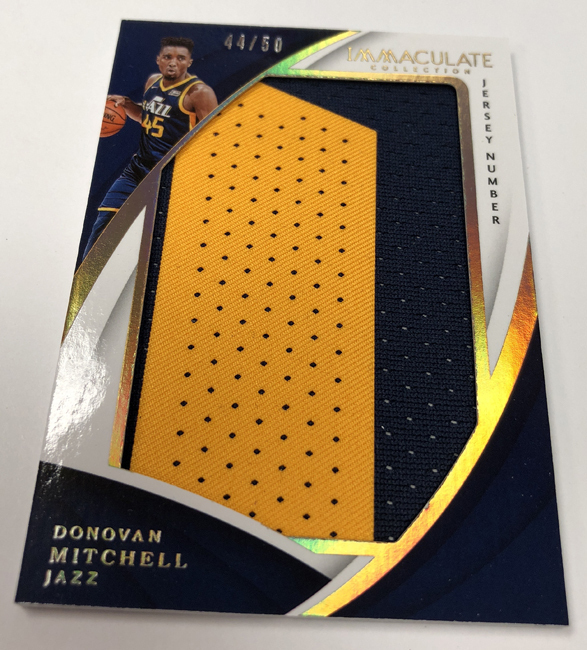 True to its potent past, 2017-18 Immaculate Basketball is steeped in some of the most unique memorabilia cards you’ll find anywhere, including game-worn jumbo patches from players’ jersey numbers, team logos and nameplates. New to Immaculate this season are game-worn jersey pieces from Brand Logos and Team Slogans. 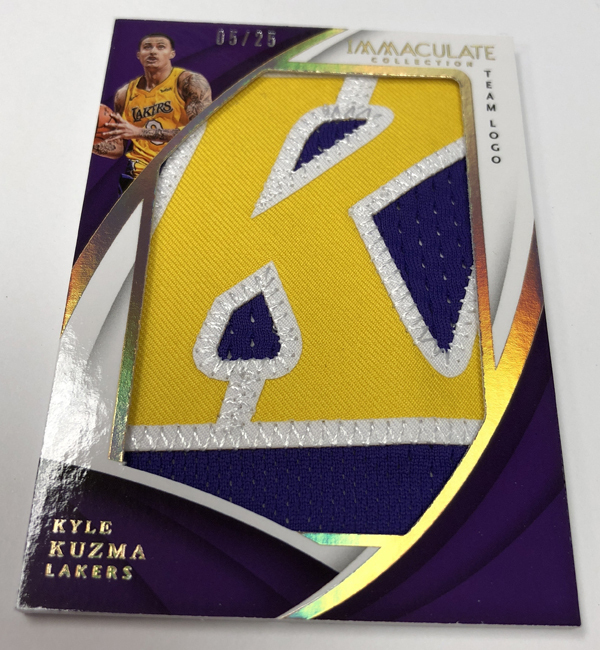 The product also includes the otherworldly Sneak Peek cards featuring entire Heel Logos, Brand Logos, Tongue Logos and shoelaces from game-worn basketball sneakers. Additional highlights of 2017-18 Immaculate Basketball include . . . The return of the iconic Rookie Patch Autographs and Patch Autographs featuring Jersey Number variations. 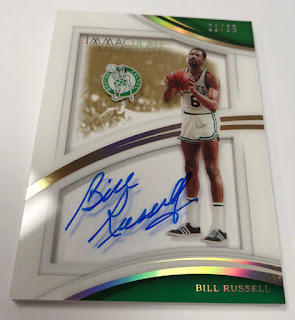 Dual, triple and quad autographs that showcase unique and classic groupings of rookies, stars and legends. 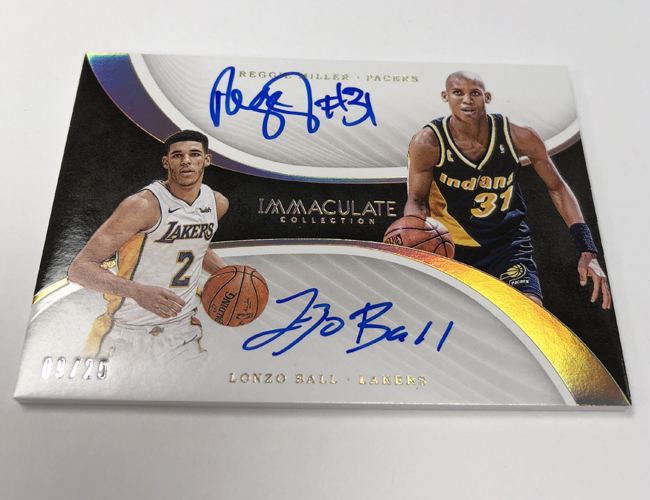 Dual Rookie Logoman Autographs return with pairings from the star-studded 2017-18 NBA rookie class. 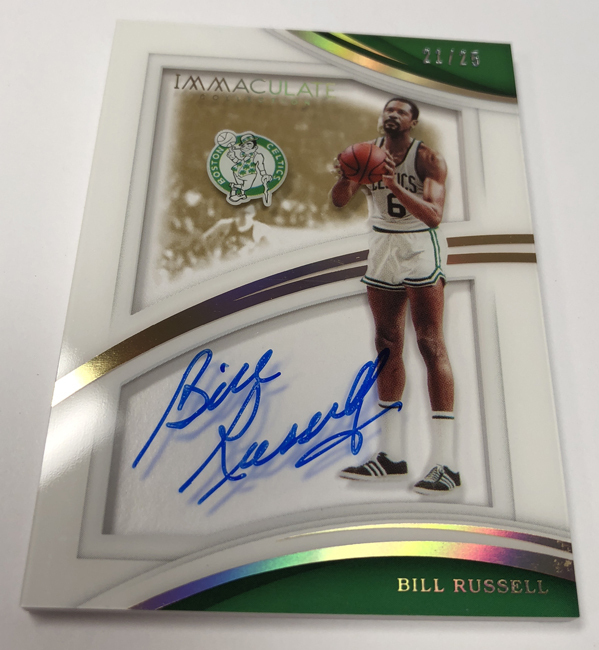 When it comes to Panini America products and this time of year, the big-time hits (autographs, memorabilia cards, key Rookie Cards, chase-worthy inserts and parallels) just keep on coming. 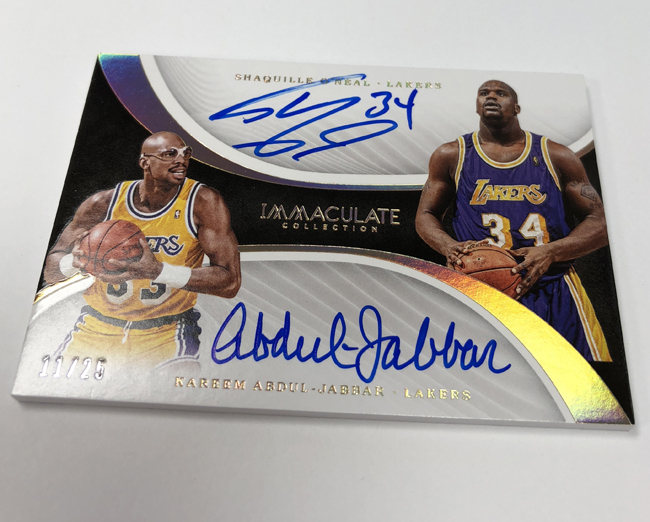 On average, each hobby box of 2017-18 Immaculate Basketball (six cards per box, five boxes per case) will deliver one base or parallel card, three autographs and two memorabilia cards.